The dreaded Reverse Split ! Well folks… there it was for all to see… the CEO of IC Punch Media, Mr. Steven Samblis acknowledging a reverse split is possible. For months and months the bashers over on LieHub have predicted Mr. Samblis would do a reverse split. In contrast, for months and months Mr. Samblis has vehemently denied and had been steadfast in his statements of not doing a reverse split. Well… Mr. Samblis’s post last night seemed to be acknowledgement of a reverse split certainly being a viable option, and in our opinion, the lead-in and set-up of one. Some of you may remember our post speaking to a reverse split here. Also, here is just one of the posts where Mr. Samblis states he would not do a reverse split because “there is no reason to“. In many, if not all of Mr. Samblis’s statements concerning a reverse split, he has always added that caveat about no need. We believe this was no accident. Has he planned on doing a reverse split all along… who knows, but its obvious to us at least that Mr. Samblis knew this was a tool in his toolbox that was at his disposal at any time. By emphasizing so frequently that he was not going to do a reverse split, he apparently had hoped that readers would latch on to the not going to part and miss and/or underestimate the no need to part. Pretty slick don’t you think ??? On a related issue regarding carefully chosen wording in an effort to mislead… take a close look at this post. In the line about getting assets back and damages from Collins, Mr. Samblis makes a true statement… however, true to what extent? Make a positive difference, a negative difference, or very little difference either way? Take a look at this post from Mr. Samblis, wherein he states “My attorneys feel he is judgment proof because if we won we would never recover a dime from him.”. So what is the point of the statement about making “a difference”? The obvious point that comes to mind is to mislead the reader. Lets look at the next statement Mr. Samblis makes in the same post. “There is nothing in either agreement that gave him majority control of the company. He could get shares but no place is any percentage of ownership talked about.“. Here again, a true statement, however, that is not the accusation of Mr. Collins. Mr. Collins assertion is that in 90-days he was to “step up as CEO”. The only “control” Mr. Collins spoke about was being elevated to CEO. Mr. Samblis carefully and cleverly attempts to mislead the reader into thinking Mr. Collins has no basis for his statements. Its clear for all to see that the provision about being elevated to CEO is certainly listed in the Mr. Collins Employment Agreement. Lets look at Mr. Samblis’s statement about the listing of Mr. Samblis’s employment contract. Mr. Samblis states “Collins said there was no record of my employment contract”. What Mr. Collins actually stated was…”Samblis failed to disclose his alleged Employment Agreement at that time. Further, Mr. Collins audited all previous SEC filings for IC Places, all signed by Samblis, and not only was there no mention of this agreement, the annual statements for years 2008, 2009, 2010 and 2011 expressly state “There is no employment contract with Executives or Directors at this time. Nor are there any agreements for compensation in the future”. Now, look at the statement Mr. Samblis quotes in support of his contention Mr. Collins is lying. Do you see anything in there about maintaining majority control of the stock? Mr. Samblis states “but it was in all the books and in public filings”. Again, do you see any mention of the Greystone Park Enterprises, Inc. employment contract in Mr. Samblis’s “example”. The public filing dated 11/14/2012 states the following: “On November 18, 2005 the Company entered into an employment agreement with Steven Samblis to be our Chief Executive Officer.”. The passage goes on to list the compensation which includes the provision of majority control being maintained. Do you see this employment contract listed in any previous filings, and specifically the part about maintaining majority control of the stock. Take a look at the below graphic, taken from the August 12, 2011 Quarterly report filing here. (click image to enlarge). Do you see anything about an employment contract? What you do see is the specific statement that there are NO employment contracts ! So… Mr. Samblis’s “example” is correct in and of itself, but has no relationship to the accusations Mr. Collins is making. Again, this appears an effort to mislead the reader with true statements which have noting to do with the issue at hand. Pretty slick don’t you think? Folks, when you read ANYTHING from Mr. Samblis, we suggest you read it carefully. Read it with the original question or issue in mind. We think you will begin to realize many, if not all, of Mr. Samblis’s statements are carefully worded to mislead and deflect the original question. Its the magician concept… shake your left hand to draw attention away from what your right hand is doing. There were some very good posts yesterday regarding how Mr. Samblis should conduct himself as CEO of the company. Mr. Samblis would be wise to heed their advice. However, its doubtful he will. For instance, take a look at this post here, and Mr. Samblis’s reply to it here. This exchange was back in June of 2013. Do you think Mr. Samblis will heed the good advice he has been given ??? It has been suggested many times, by many investors, that Mr. Samblis hire a professional public relations officer, however apparently Mr. Samblis sees no merit in this action, in spite of the vast numbers of investors telling him its needed. In fact he really doesn’t need to hire one, as it likely any number of posters/investors would be more than happy to step up and volunteer their expertise for this much needed service. But still, all this good advice falls on deaf ears. What does that tell you about the future of the company regardless of any productive business decisions Mr. Samblis may make in the future. Mr. Samblis is quick to blame anything and everything bad on someone or something else… he really needs to consider revisiting that concept if he has any hope whatsoever of turning this company around ! 1) Punch assets were valued at 2.8 million (or 135 million shares at the time of purchase)… Mr. Collins has returned 153 million shares. That far exceeds the value of the asset purchase. Mr. Samblis has said numerous times that the asset purchase is completely separate from the employment agreement. 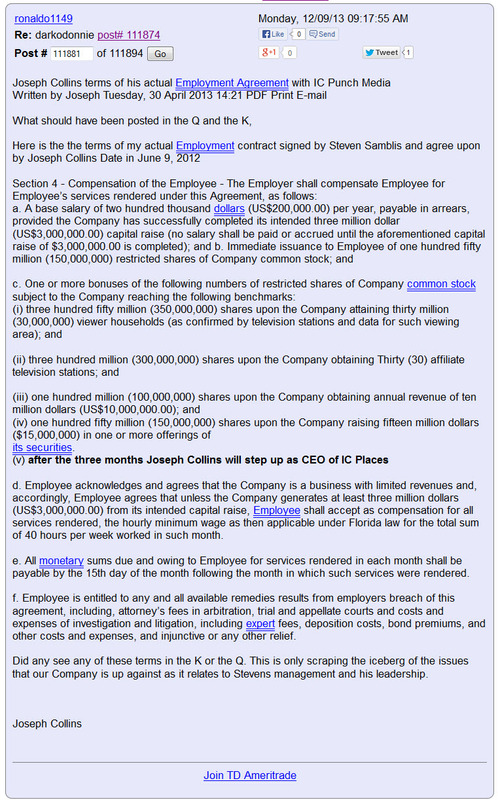 Did Mr. Collins return the asset purchase shares, or the employment shares? How could that ever be determined? Of course it will be argued by Mr. Collins that he returned the asset shares, and how could that be disproved? 2) What assets are there really? The biggest asset (some may disagree, (Mr. Samblis has)) is the Punch name. What else could there be… some camera equipment, office equipment, video library of old movies. No real estate was listed in the asset listing, so how much could these assets really be worth? The asset listing listed 1.4 million in “tangible” assets. There is a lot of interpretation within the term “tangible”, such as the film library at $650,000., and Software and Broadcast Equipment at $757,000, does anyone think that might be just a little over inflated? Would they be worth spending 10, 20, 50 thousand dollars in legal fees to attempt to get them back… and would the attempt be successful? 3) The public move to regain assets could be simply the latest maneuver to garner interest in the stock and perhaps drive up the price. Public statements like the Chinese deal, CVN deal to be in 12 airports by the end of 2013, and each airport worth $192,000. in yearly revenue, new network launch to numerous markets around the country, etc, etc, etc. There have been numerous attempts in the past to publically release statements to the investing public that many say have proven to be false and/or never come to fruition. What makes this public statement about regaining Punch assets (that Mr. Samblis has said he didn’t want) any different? It appears the recapture of Punch assets stands even less chance of becoming a reality due to Mr. Samblis’s very weak argument that Mr. Collins never returned the shares used to purchase those assets. Mr. Samblis will have a VERY difficult time proving WHICH set of assets Mr. Collins returned. If Mr. Collins had returned none, that would be a completely different ball game, but as it stands now with Mr. Collins having returned shares in excess of the amount exchanged for the asset purchase agreement, it looks like any money spent in legal fees to get something Mr. Samblis stated is poison… just makes no sense. Still think attempting to get back “poison” assets makes any sense ??? Perhaps Mr. Samblis can lay out WHY getting these assets back now is different from when he said there would be noting to gain going after them. What has changed ??? What does 2014 hold for PNCH ? That’s the big question… what does 2014 hold for PNCH ? There are some who believe Mr. Samblis walks on water and will pull the company out of near bankruptcy and emerge so strong the stock PPS soars to over a dollar or more. Just buy more and hold they say… Steve will deliver! Then there are disbelievers. These are the people that claim to see the writing on the wall as they say. They understand their investment is worthless, and Mr. Steve Samblis alone is to blame for the bad decisions that led to the company’s downfall. Then there are the in-between’s. The in-between’s understand the severity of the situation, understand their investment is very likely lost, understand Mr. Samblis will very likely not change in order to make things better, and no amount of avid blind support will change the situation at hand. However… they still hold out unsubstantiated hope. They know in their logical mind that nothing will bring this company back without massive changes (which are unlikely to happen), but using their emotional mind they still hold some hope that it will. They hope for a miracle. We have given the possibilities some thought. We predict… that PNCH (the public company) will be absorbed by Mr. Joseph Collins of Punch TV and as a result will become the new public company using the same ticker and a modest change to the name but still reflecting Punch in some fashion. Mr. Samblis will be forced to take a modest payment in return for his agreement to the terms of the settlement. Let us lay out the reasoning for this bold prediction. Depending on which group above you align yourself with will determine your reaction to our prediction. The substance of our prediction is the 50-million dollar lawsuit, however other factors play a role in the prediction. Although the lawsuit (as of this writing, and as far as we know) is still “pending”. That is a wild card that could sway any outcome supporting our prediction. If the lawsuit becomes a reality (and it likely will), then our prediction, in our minds, becomes a certainty. Mr. Samblis will have no choice but to settle… and any settlement will likely include Mr. Samblis giving up the company as a deal breaker. If the lawsuit becomes a reality and Mr. Samblis does not settle, which given his previous actions that demonstrate his arrogance, he may bet the farm and lose even the pittance he would have received in any settlement. Also, and reinforcing our opinion as to the winner in the suit, is that Mr. Collins appears to have far more resources to wage a court battle than Mr. Samblis does. In most legal actions, the side with the most resources (money to fight) wins. We have previously laid out the merits of the case against Mr. Samblis here so we won’t list them in this post, but if one looks logically at the evidence, it appears Mr. Collins has a VERY strong case against Mr. Samblis. Yes, as we said in the referenced post, anything can happen, but we think Mr. Collins has a better than average shot at prevailing in this lawsuit. Why would Mr. Samblis accept a settlement that involves him losing his company? We think because faced with the likelihood of a complete legal loss, and likely owing a substantial sum to Mr. Collins for the harm to the Punch TV business if the action would actually go to trial, coupled with the legal fees to fight the suit… he will accept something rather than noting, and likely be in debt to Mr. Collins for the damages accessed. Mr. Samblis walking away with some pocket change is far more favorable than losing his company AND being in debt to Mr. Collins for the damages accessed by the court, AND being bankrupt by the legal fees fighting a lawsuit he has very little chance of winning. Also, Mr. Samblis’s reputation is, shall we say, tarnished. Walking away with some pocket change will allow him to break free from the Punch name and likely start another company, free from the past baggage of the Punch issues, and the current group of investors that have lost big under his leadership. Given that Mr. Samblis likely blames the company’s downfall on others (never himself), he will likely not associate his past actions as negatively impacting any new venture he may attempt. He would likely welcome an opportunity at this point to free himself from his current situation… i.e. his company’s stock is in the toilet (as in near worthless), he is about out of shares to sell to raise cash, many investors think he is incompetent, and there is little hope of anything changing significantly in the near future to turn things around before he runs completely out of funds to keep the company operating. For shareholders, the above may be just what the doctor ordered ! It’s highly unlikely the company will survive under Mr. Samblis’s leadership. However, Mr. Collins at the helm may just be the spark that ignites a fire under the PPS. Investors knowing Mr. Samblis is no longer involved with the company, may feel more secure about investing in it, or more secure that their current investment now has a fighting chance of improvement. Say what you will about Mr. Collins, we doubt he would put himself in some of the situations investors found themselves in with Mr. Samblis. If you have followed the progress of Punch TV since the breakup, you will see that Mr. Collins has progressed much farther than Mr. Samblis has in the same amount of time, and exhibited far more professionalism while doing such. Mr. Collins has been in the broadcasting business much longer than Mr. Samblis. With investment funds behind him, Mr. Collins is likely to progress much farther in a shorter amount of time than Mr. Samblis could ever hope to. Simply compare the achievements of both men since the breakup and we are confident you will come to the same conclusion. Even if Mr. Samblis would win the lawsuit, which would be like the odds of winning the Powerball lottery, AND Mr. Samblis changed the ticker symbol, AND Mr. Samblis changed the name of the company… the one remaining factor would be Mr. Samblis would still be the CEO. Even with a new company name, the most significant factor that caused the current sad state of affairs is still present. As they say, doing the same thing over and over and expecting a different outcome is the true definition of insanity. When investing in a company, you are really investing in the leadership’s skills and knowledge of the person in charge to make the right decisions to grow the company. Where has Mr. Samblis’s leadership brought the company to date??? Simply changing the company name and trading symbol does no more than changing the label on expired meat. Does anyone really think that potential new investors in the same company-new-name will not find history on Mr. Samblis? Would new investors be so naïve to think Mr. Samblis could do any better with the newly named company just because the name was changed ??? Would CURRENT investors think things will change just because the name has changed??? So… we think everyone can agree… SOMETHING will happen… it’s simply a matter of WHAT will happen. Neither party is going to let the current situation continue as it is. Mr. Collins feels he is being harmed, and Mr. Samblis is in a desperate situation with the current condition of his company. What will happen ??? Think we are nuts ? Then what do YOU think will happen ? Let’s hear YOUR prediction on how this plays out… and why ! What would you like to see happen, and why ? Do you think Mr. Samblis has the leadership skills to turn his company around even if the lawsuit were not a factor, and why ? And if you think Mr. Samblis does have the leadership skills to turn this company around… why hasn’t he done so in order to prevent the current condition of the company ? IF… Mr. Collins becomes CEO of the public company that is now PNCH, would you feel more or less confident that your investment will increase in value ? If Mr. Samblis accepts a settlement that allows him to walk away and start a new company… would you invest in his new company ??? Hopefully we have provided some food for thought. Regardless of you publicizing your thoughts and predictions here, or other public venues… be thinking about the possibilities and likelihoods of how this PNCH thing could play out. Again, you must agree… SOMETHING will happen, it’s just a matter of WHAT !